Expedition 58 crew members enter the SpaceX Crew Dragon for the first time. They are wearing protective gear to avoid breathing particulate matter that may shaken loose during launch. Aboard the space station, NASA astronaut Anne McClain, David Saint-Jacques of the Canadian Space Agency, and Russian cosmonaut and Expedition 58 commander Oleg Kononenko opened the hatch between the Crew Dragon and the orbital laboratory at 8:07 a.m. EST. The crew members opened the hatch to Crew Dragon following standard leak checks and pressurization since the spacecraft completed its hard dock to the station at 6:02 a.m., the first autonomous docking of any U.S. spacecraft to the International Space Station. 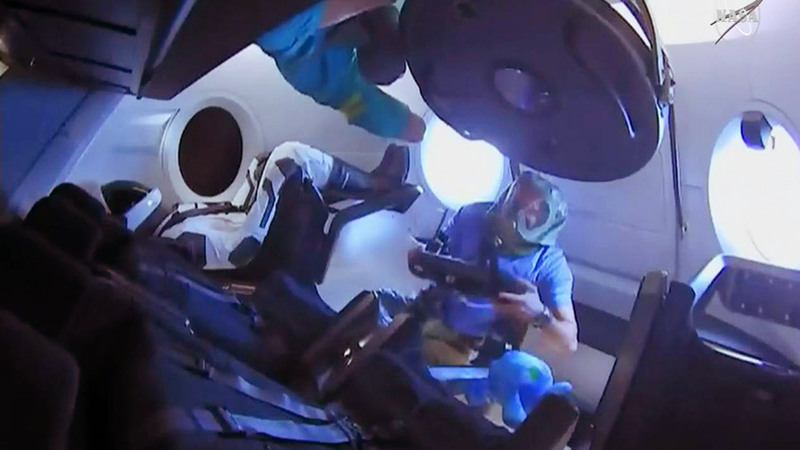 In addition to carrying Ripley, an anthropomorphic test device outfitted with sensors to provide data about potential effects on future astronauts who will travel in the Crew Dragon. NASA also sent more than 400 pounds of crew supplies and equipment to the space station, including bulk overwrap bags containing more than 1,000 food and drink packages for the crew. For operational missions, Crew Dragon will be able to launch as many as four crew members and carry more than 220 pounds of cargo, enabling the expansion of the inhabitants of the space station, increasing the time dedicated to research in the unique microgravity environment, and returning more science back to Earth. The Expedition 58 crew members will host a welcoming ceremony for the Crew Dragon that will air on NASA Television and the agency’s website beginning at 10:45 a.m.
More details about the mission and NASA’s commercial crew program can be found in the press kit online and by following the commercial crew blog, @commercial_crew and commercial crew on Facebook. Learn more about station activities by following @space_station and @ISS_Research on Twitter as well as the ISS Facebook and ISS Instagram accounts. This event, upon successful completion, is incredible importance to our country. It marks the return of America to space and orbital transportation. We will no longer have to depend on other countries to handle our transport needs at great expense. Space-X will be able to provide NASA with reliable transport service more economically with reusable equipment. Go SpaceX and Go NASA! So glad to see U.S. back in the saddle again. Congratulations Expedition 58-59 for a great and beautiful job well done!! Thank you SpaceX and all at NASA . This will Make for a greater world . YOU are Appreciated ! Congratulations from Russia! Go Elon Musk, Go NASA!